I did not think I knew what curriculum mapping was till I had been in my current position, which is in a College of Education, for several years. However, last week I received the schema below from a colleague of my wife who gave a talk at Eugene Lang College (at the New School for Social Research) not long ago. The new dean of Lang showed her this diagram, mentioning that they did not even know who Peter Taylor was. C’ est moi. I taught at Lang College in 1986-7. At that time—and this seems to be still the case—all courses were taught in small seminars. The schema attempts to depict the relationships among the seminars, although, unlike serious curriculum mapping, it does not convey anything about the sequence a student needs to take courses in. (This schema did not include any of my “Science, Technology and Power” courses, so I must have done it near the end of the year when I knew I was moving.) I wonder if a three-dimensional version could overcome the fudge of the circled letters that are used to position a course that is included somewhere else in the schema. Lost in time is what my method was for deciding how to name and position the overlapping bubbles. The issue of how to support interdisciplinary faculty members arose during a lunchtime chat with Tom Gieryn, a sociologist of science who is currently Assistant Provost for faculty and academic affairs at Indiana University. Interdisciplinary faculty may be doing wonderful work, but it does not necessarily get understood or appreciated by the traditional departments in which formally they are members. This led me to propose a variant on the scheme I developed many years ago for diversity hiring and spousal hiring. 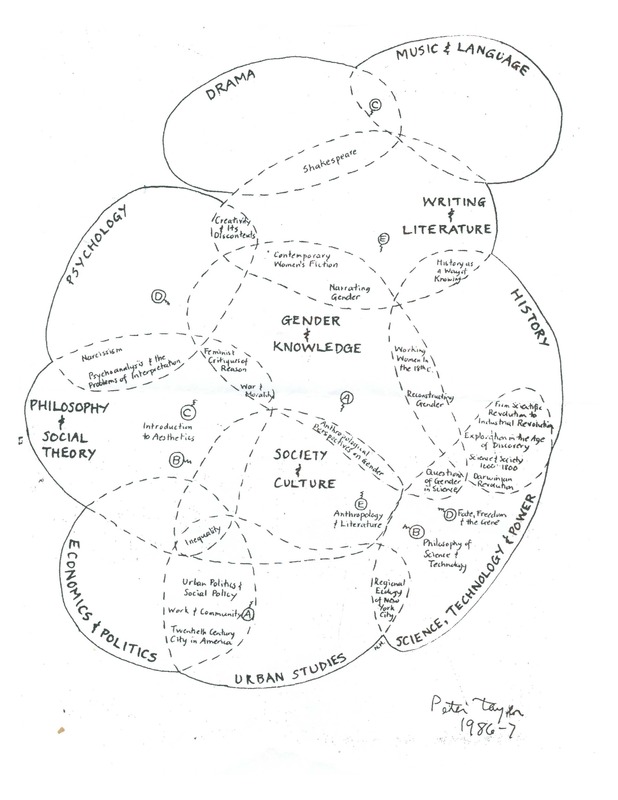 The basic idea is to create a pool an institution-wide pool of “interdisciplinary innovation” (II) lines. The II line stays with the department only as long as the appointee does. The appointee goes through normal tenure and promotion decisions, free from the ill-feeling that comes from occupying a line that some people in the department thought might have gone to a candidate closer to the department’s traditional disciplinary profile. Stay tuned to see if I.U. initates a system anything like this.